It’s the plot of the film – cobbled together from various sources including The Karate Kid and The Raid: Redemption – that could’ve done with more work. Ronnie, who is packed off by his dying father to a kalaripayattu academy in Kerala, meets Sia (Shraddha Kapoor) on the train heading there, and pretty soon they are in love.I’m going with two-and-a-half out of five for Baaghi. It’s certainly an improvement on Tiger’s debut film Heropanti, but script problems persist. 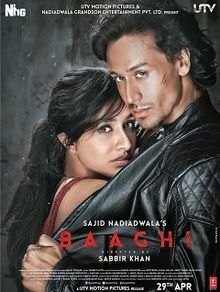 Watched Baaghi. With focus on entertainment, this one is, without doubt, the best action film to come out of Bollywood in recent times…Director Sabbir Khan taps Tiger Shroff’s biggest strength: Action. Penultimate 30-minute drama/action of Baaghi leaves you spellbound…Shraddha Kapoor looks gorgeous & compliments Tiger. She springs a big surprise in the extremely well choreographed action sequences.The fab locales of Kerala and Thailand make Baaghi a visually stunning experience. Baaghi has all the merits to hit the jackpot! On the whole, Baaghi has extraordinary action and good music as its plus points but a weak script as a minus point. It will score with the masses and will, therefore, do very well in single-screen cinemas, masses-frequented multiplexes and smaller towns but its business in the better multiplexes will be limited. This is by no means a terrible film but the actioner, that attempts to find support in a threadbare story, is far from riveting. The screenplay fails validate the cause of their rebellion. Baaghi blooms only during the fights but by the time the clock ticks towards the climax, you are exhausted. How much can you hoot for broken necks and crushed bones? You could try finding thrill in Tiger’s kicks but the film has nothing more to offer. You know how some video games play out an origins story before the player gets into a console-pounding, level-unlocking mode? Now imagine a movie, a foolish, exhausting one, if you will, that does the same but the action only lasts for about 20 minutes while the preceding two hours are taken up in what led to it. Low on genuine emotion, Baaghi is only as engaging as a badly designed video game. The love story is interspersed with flashy martial arts action scenes, but given a male lead who is hard pressed to convince us that he has a genuine grouse against the world, the crass concoction simply does not get off the ground. The insipid acting all around does not help the cause of this wayward rebel one bit. Baaghi is eminently avoidable. Keep out of its path. Take a dramatic Bollywood love story and crash land it into an adrenaline-pumping fight movie, and you have Baaghi. With soft emotions and hard knock outs interrupting each other, the Tiger Shroff-Shraddha Kapoor movie is jarring.Ultimately, instead of a well-etched strong yet compassionate character, Shroff comes off as someone with split personalities. He laughs, smirks, cries and fights on repeat.In short, The Karate Kid enters Bloodsport and appears in a hurry to become Ong-Bak without losing the essential Bollywood qualities. Baaghi shines only in patches. 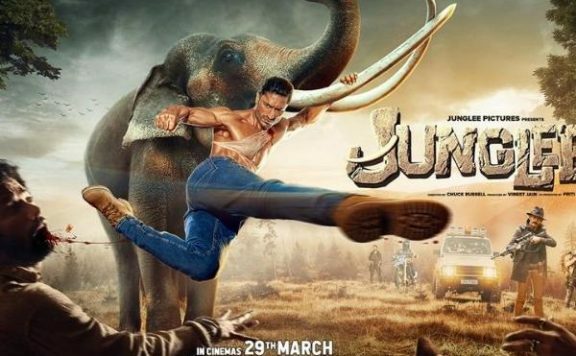 Why does a film with a new hero, who can reveal a beautifully muscled chest, and do such jaw-dropping stunts, not go for broke and create freshness all around? I enjoyed the first half, and yawned through the much-too-long-drawn second. it is a pleasure to see this young actor move, no jerk, all flow. When he is in action, that is. When he is ‘acting’, he is still clearly a novice. In the age of sensible, realistic and unconventional cinema, here comes a massy, masala entertainer. Sabbir Khan’s Baaghi is a commercial cinema to the core. There is nothing new in the story; and the makers aren’t apologetic about it.Director Sabbir Khan sticks to the old-school formula of filmmaking when it comes to his storytelling – emotions and dialoguebaazi galore. He takes a new-age stance only where his action is concerned. Baaghi is a high-octane masala feast. Watch it for Tiger Shroff – India’s best young action hero by far. On the whole, BAAGHI is a typical masala entertainer which scores high on action and performances from the lead cast. With focus on entertainment, the film is, without a doubt, the best action film to come out of Bollywood in recent times. It has all the merits to hit the jackpot. At the box office, it will be lapped up by the masses on the account of its masala quotient. Highly recommended. Action is the only good element in this film. From hand to hand combat to Kalaripayattu, the action is well-captured. With Baaghi, the director gets a little over ambitious and makes a film that is inspired from The Raid : Redemption. While he manage to make Baaghi watchable with its slick action, as a storyteller he fails to execute the right balance of romance and action. Baaghi is an out and out action flick, which is ruined by romance and a tepid plot. I am going with a 2/5 for this film! Tiger Shroff can break bones with his bare hands, but he doesn’t have the power to emotionally sway viewers. In the violent romance Baaghi, his acting is as rigid and stiff as his washboard abs. While it is inspiring to watch him demolish his enemies using Kalaripayattu (traditional martial art form from Kerala), the motive behind him going on a rampage is poorly established. If you are looking for an all brawn and no brains feature, then watch Baaghi. Otherwise, it is wise to duck this missile of a movie. Baaghi is reported to be based on 2004 Telugu movie Varsham and 2011 Indonesian film The Raid: Redemption. Shortly after arriving at a martial arts academy, a troubled young man falls for the girl being wooed by his rival.